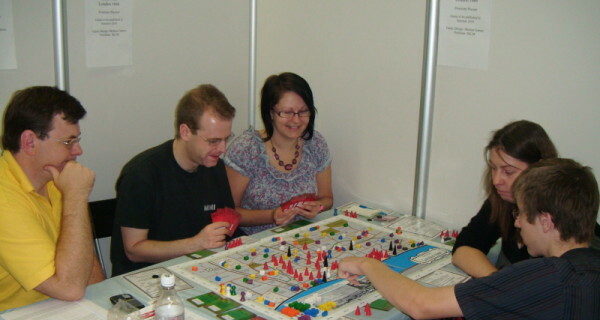 I run UK Games Expo – the UK’s largest non electronic multi format hobby game convention. By this I mean we have board games, card games, roleplaying games by a multitude of games companies in an event over 3 days that attracts 6000+ people. Now in its 6th year, this event hosts companies showing all their new games on tables where the visitor can sit down and try them out. I am also the designer of the board game Great Fire of London and have my own game design house Medusa Games. For these two reasons I often get emails along the lines of “I have this idea for a new game, how do I get it published?” This article is going to cover some of the answers. Here then are some tips. Do your research: Find out what is out there. So go to Board Game Geek. This is the focal point on the internet for all things related to board games. See what games are popular. Look at the forums and get a feel for what is liked and disliked. 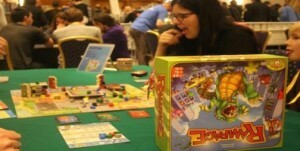 The largest board and card game convention in the world is Essen Spiel each October in Germany. 150,000 board gamers visit this over 4 days. There are 400 or so companies and 700 new games each year. Just walk the halls and see what is being made. 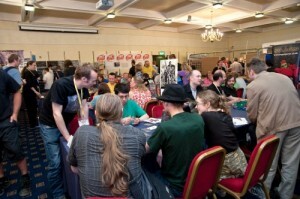 In the UK come to UK Games Expo in May/June. In the USA Origins or Gencon Indy are worth a visit. Play the games, meet the designers and make some contacts. Get a feel for the different sort of game mechanics (the ways games work) and see how the successful ones often have a novel mechanic going on. The process of publishing a board game is a little like writing and publishing a book. Indeed some companies call game designers the GAME AUTHOR. You first produce a early version and begin play testing it. This will be cardboard and sellotape and made on your home PC. You need to see if the game MIGHT work. This means getting players (often friends and family) to play the game over and over again till they and you are sick of it. The game will go through various versions, akin to drafts of a book and just as an author needs an editor to see what does not work in a book, a designer needs play testers to pick up on the flaws in a game concept. After many plays the game design will take shape. It is a good idea to bring the game to a convention such as UK Games Expo or one of the several smaller local cons that attract a couple of hundred gamers as you can get feedback from players. Taking it to a games club is a good idea as well. be prepared for negative remarks and the need to go back to the drawing board. I have abandoned several game designs in the early stages. OK I have a working game now what? You now need to get a publisher. Here you have the choice of doing it yourself if you can find printers and component manufacturers or using an existing company. Just like an author landing a publishing deal you will need to convince a company that you have a game people will buy. If you have gained contacts in the gaming world you will occasionally find one of them would consider helping the game become a published game IF they feel it has merits. This is where taking the game around the conventions can be of value because if a game has legs gamers will recommend it and a publisher might take notice. Alternatively pitching the game idea to a publisher is an option. Again by having done your research at BGG and by visiting the cons you will know who the companies are and have chatted to some and find out who is likely to be open to game proposals and who is not wanting game ideas. The key thing at this stage however is DO NOT approach a company until you have a game well developed and play tested. Don’t turn up with an idea that you have played twice. There is a serious risk it will fall apart on play testing. Get it right first. In this regard writing books and designing games are identical. Finally if all goes well the game gets released. It is good to link this to a large convention. In the UK the UK Games Expo is the one to choose but the largest in the world is the immense Essen Spiel. Getting a stand there is a good way to reach a large audience of board game enthusiasts. We sold almost 400 games of Great Fire in 4 days there. Now do not get the idea that you can retire on the proceeds. Just like publishing books MOST games will not sell much. You can also forget about being the next Scrabble, Monopoly or Cluedo. Just as it is hard for new authors to break into the mainstream so is it VERY hard to get anywhere near a high street store. But like with books there is pride in producing a game and saying – look what I did. Why all this talk of hobby games: surely I need the mainstream marketplace? This leads to a final point. I often get asked by potential game designers “should I approach Waddingtons” .They have the idea that they sell the game to a BIG multinational and it is in the high street shops for Christmas and they sell millions of copies. The problem here is that only a VERY few NEW games are made each year by these big companies. Think about it – when you go to a toy shop you see endless versions of Monopoly or Trivial Pursuit. 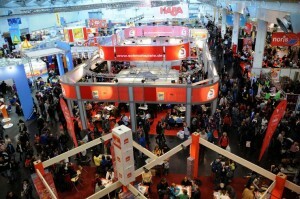 700 new games are released each year at Essen. Only 1 or 2 MIGHT manage to penetrate that mainstream market. Most mainstream customers – your aunt Flo for example – buys one new game maybe in a year. Probably a copy of Monopoly for a niece that never gets played apart from on Boxing day. You MIGHT be the lucky one. It is more likely however that the big multinatinals wont even look at the game. If you instead target the game for the thriving if much smaller Hobby Game market and the game is good and you do your marketing right then it is MUCH more likely that you could sell a few hundred games to hobby gamers who love their games and each buy a good number a year. If you can get a little following then later games your make might sell too. The reality is that many companies and designers are disappointed and loose money at this business. Some better organised ones cover their costs, have fun along the way and enjoy the business. A few companies (and here I mean a tiny handful in the UK make a bit of money.) So having a realistic attitude is the right way to go. So get online now and learn about the world of games via BGG. Find out abut local games clubs and get to them and start playing games. 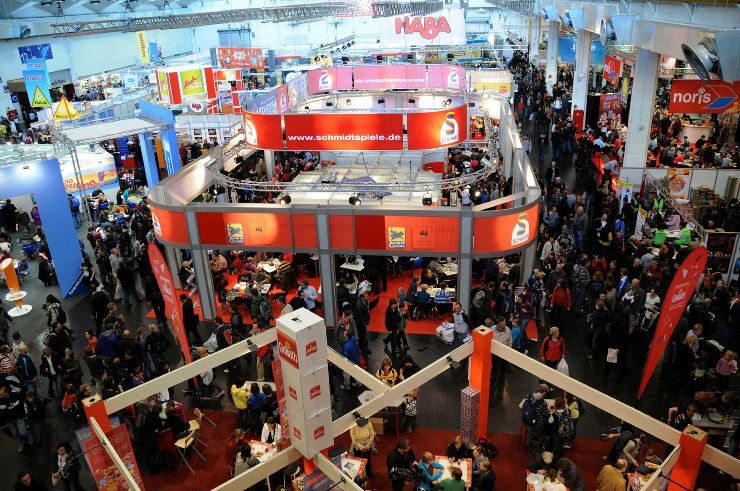 Then get to Essen , Expo, Origins or Gencon (and other cons). Get your game playtested A LOT. Then – and only then approach publishers. Good luck and see you at UK games Expo! Tuesday 4th September – The Fire at full fury! Now begins the practice of blowing up of houses in Tower-streete, those next the Tower, which at first did frighten people more than anything, but it stopped the fire where it was done, it bringing down the houses to the ground in the same places they stood, and then it was easy to quench what little fire was in it, though it kindled nothing almost. W. Hewer this day went to see how his mother did, and comes late home, telling us how he hath been forced to remove her toIslington, her house in Pye-corner being burned; so that the fire is got so far that way, and all the Old Bayly, and was running down to Fleete-streete; and Pauls is burned, and all Cheapside. I wrote to my father this night, but the post-house being burned, the letter could not go. Samuel Pepys Diary for 4th September 1666. 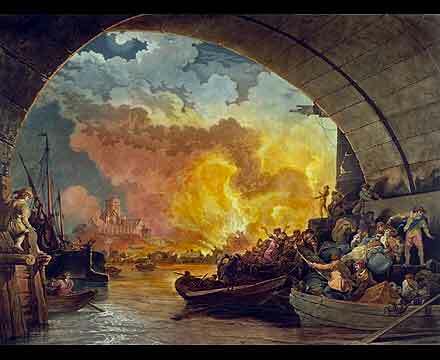 Tuesday 4th September 1666 was the worst day of the Great Fire of London. The strong wind was still blowing north and west and was driving the inferno onwards. This was the day when panic really began to set in at Westminster. The king’s court began making plans to evacuate even though the fire was still some distance away. Yet there was hope even in the midst of unbelievable destruction. James, Duke of York and his men were working flat out to try and stem the westward flow of the fire. They had hoped that the River Fleet – a refuse filled sliver running south towards the Thames – would be a barrier to the fire. This was a vain hope as the fire jumped the river and ignited buildings on its west bank and then advanced on towards the Temple and the Inns of Court. Despite the disappointment, James carried on pulling down buildings, trying desperately to create a fire break in the west. St Paul’s Cathedral was one of the wonders of the Christian World. Its spire (which fell down after a storm some years before) had been one of the highest in the world and it still loomed over the city. It was natural that people should put their faith in its vastness. As the fire rolled west towards the cathedral that Tuesday those living in the area, including the booksellers that populated the region around it hurried to push belongings into the vault and interior and up against the walls hoping the churchyards and the stone walls would protect them. This proved a vain hope. The church had been neglected during the years of the Commonwealth and in 1666 Christopher Wren had erected scaffolding to help him restore it. That same scaffolding caught fire. 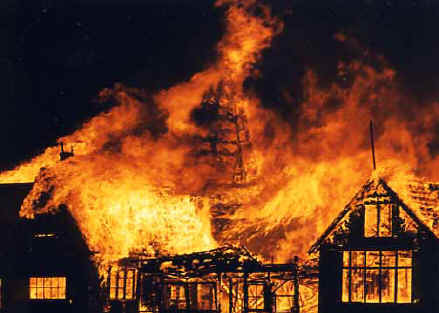 the fire spread to the roof and soon the structure was inflames – a vast fireball in the centre of the flaming city. The fire was so hot that the roof tiles melted and lead ran down the street. The tombs and coffins burst asunder and corpses literally fell and leapt out of them including a remarkably preserved bishop of two hundred years before who landed on his feet and became, after the fire, a celebrity visited by celebrities and common folk. Samuel Pepys lends a hand. The first glimmer of hope that the fire could be contained started when parties of soldiers, one led by Samuel Pepys, rolled barrels of gunpowder from the Tower into the streets nearby and started blowing up whole blocks of housing. This proved one of the only effective means of stopping the fire. In the east – where the fire had been approaching the Tower itself – the fire was under control but in the west the fire incinerated Cheapside and the city markets and rolled on by the Cathedral and seemed as unstoppable as ever. In the fields around the city a vast population settled down to sleep rough through the third night of the fire, many believing that the end of the world had truly come. Tomorrow: Wednesday 4th September – Hope at last! About four o’clock in the morning, my Lady Batten sent me a cart to carry away all my money, and plate, and best things, to Sir W. Riders at Bednall-greene. Which I did riding myself in my night-gowne in the cart; and, Lord! to see how the streets and the highways are crowded with people running and riding, and getting of carts at any rate to fetch away things. Samuel Pepys Diary for 3rd September 1666. The people of London, terrified of the fire and furious at the destruction did what most men and women do at such times. They try and find someone to blame. In London in September 1666 there were plenty of people to blame. England was at war with both France and Holland in the Second Anglo Dutch War. So any foreigners -especially from Holland or France were set upon in the streets and accused of Arson. They were searched and if matches found were beaten or even threatened with hanging. Astrologers who had predicted a terrible calamity on 1666 were also suspects as were manufacturers of fireworks. Fear of witchcraft meant that some women were attacked – even a poor girl who was caught carrying a chicken in her petticoat which was mistaken for a fireball that she was about to throw. Because of fears of another Gunpowder type plot Catholics were also accused to starting the fire. Utter panic set in during Monday as the city folk realised that the destruction could be extensive. Thousands of Londoners evacuated whatever belongings they could in cart, on foot or by boat. Some folk with the eye for making a quick fortune began hiring out carts and boats at exorbitant rates. A cart which before the fire would cost a couple of shillings could be as much at £40 on that monday! The streets were jammed with panicking people, carts, wagons and -Â desperateÂ to keep order – James’ Â troops. 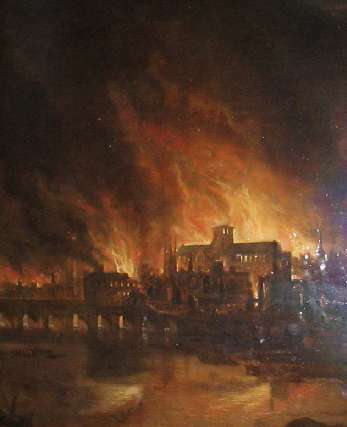 The fire – driven on with strengthening winds had reached the North end of London bridge and destroyed it. Fortunately a fire break on the bridge – the result of a previous fire 30 years before – prevented the fire spreading further south. Nothing, however, could prevent the fire spreading to engulf the great trade centre of the Royal Exchange on Cornhill which had been build in Queen Elizabeth’s time, nor the loss of the shops on Cheapshide. Whilst running around protecting foreigners and Catholics and bringing some order to the crowded streets, gradually James establishes working parties – each with orders to pull down houses to slow the spread of the fire. Furthermore wealthy citizens began paying for hired labour to help with the efforts. It was not much but we start to see the types of actions that will eventually save London. Tomorrow: Tuesday 4th September – The Fire at full fury! Here by ye permission of heaven, hell broke loose upon this Protestant city. 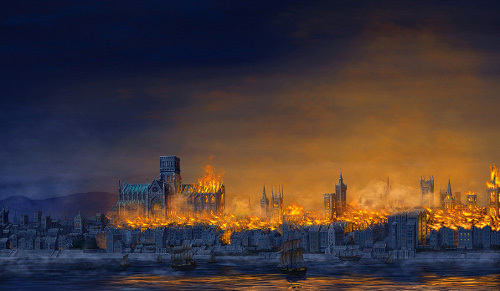 In 1666 London was a bonfire ready to light. It was built of wood and thatch buildings – teetering tenements that leaned close together. It was full of foundries and bakers, glaziers and tanners all with fires. Its warehouses stored vast quanities of combustible material. It had little in the way of effective fire fightingÂ procedures. The summer had been long and hot and the city was dry. All it took was a spark. Thomas Farriner (or Faynor) was the King’s baker on Pudding Lane near London Bridge. He baked ships biscuits for the Navy. On Saturday 1st September he had retired to bed but someone – himself, his maid or his journeyman had forgotten to put out the fire. Wood, ready for the mornings baking was stacked nearby. Between midnight and 1am on Sunday morning 2nd September it is assumed that a spark from the fire must have ignited the wood. This spread and soon the bakery was in flames. Thomas and his family escaped out of an upstairs window BUT their maid did not escape. Afraid to cross the gap to the roof behind she stayed behind and perished. The fire spread quickly and soon the entire street was on fire. Around the time that Pepys was woken on Seething Lane a little to the east, the Mayor Thomas Bloodworth was summoned and on inspecting the fire made the quote that wouldcome back to bite him later: “Pish! A woman could piss it out”. He returned to bed without giving any orders to pull down any houses to creat fire breaks. Those trying to fight the fire struggled on but effort were hampered by the fact the pump nearest Pudding Lane was broken. There was some attempt to bring fire engines to the scenes but these were huge and heavy and could not reach the scene. Pepys takes action but the Mayor does not! In the morning Samuel Pepys realised that the fire was spreading fast and would soon by out of control. He hurried to White Hall to see the king. 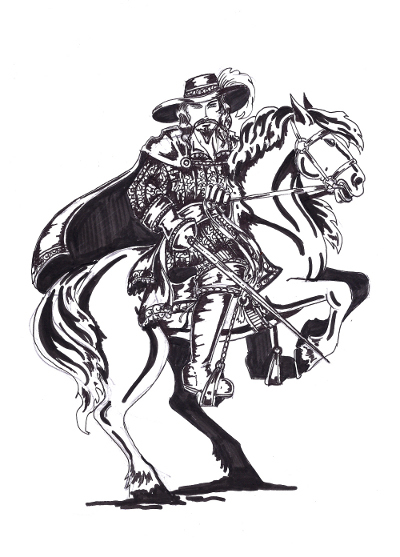 Charles II ordered him to tell the Mayor to pull down houses and to take the offer of extra troops from The Duke of York’s guards (commanded by his brother, James). Pepys hurried to see Bloodworth. he found the mayor in a state of hysteria, complaining that no one would obey him. Bloodworth refused the offer of troops. This was because the City had deep suspicions about the crown and indeed had been strongly for parliament during the civil war of only 20 years before. City officials had a fear of royalist troops in the city and wanted to avoid that. Bloodworth also ignored the king’s orders about pulling down buildings, fearful that he would be held financially responsible. The King sailed down the river in the afternoon and was apalled at the spread of the fire and even more astonished that his orders had been ignored. He overrode the authority of the mayor in the area west of the fire and started the process of having house pulled down. This article is one of a series connected with the release of the new paperback of The Last Seal my historical fantasy set during the Great Fire of 1666. Before the Fire – early 1666. London, in early 1666, was a city still suffering from the great plague. The death rate was slowing down but new cases were still happening even up to the time of the fire. 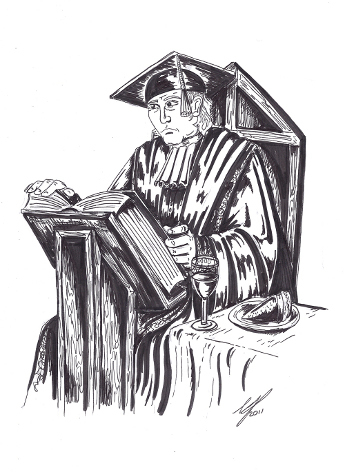 The King and his court has evacuated the city and the government was run from Oxford through the winter and early spring. Yet in the summer of 1666 life was returning to the city. The markets were open and trade was thriving once more. England was at war with Holland and France and that meant that in the summer the fleet put to sea looking for an engagement that would decide the war. That fleet needed provisions and one of the bakers that supplied the all important ship’s biscuit was Thomas Farriner of Pudding Lane. At the time accusations of conspiracy would fly around the city as rapidly as the fire itself. Catholics were to blame, or French or Dutch spies or maybe republicans. Then again maybe it was the will of God. London was a cesspit of sin and the wrath of God would be visited upon it. That at least was the predictions of astrologers before the fire. This year – 1666 – was full or porent of doom and the unrighteous would soon suffer hell fire. That is what people said. Eventually the truth came out. It was not the judgement of heaven or the evil act of malicious enemies. No it was merely a baker forgetting to put out his ovens. Thomas Farriner was to blame. Not that he ever admitted to this himself of course. But we should not blame Farriner. Really it was the case that the city of London in 1666 was ready for this disaster. Most houses in this crowded and congested city were wood and thatch leaning precariously towards each other. The city contained hundreds of workplaces, many of which were fire hazards foundries, smithies, glaziers and was full of warehouses which had stores and cellars of combustibles. That summer of 1666 had been one of the hottest in living memory making the buildings dry as tinder. Finally there was a strong wind blowing north westerly for the first three days fanning on the fire. Day 1: Sunday 2nd September circa 1am Fire starts at the Bakers on Pudding Lane. 4am Lord Mayor Bludworth visits but down plays it and goes back to bed! Later that day he fails to act decisively. Samuel Pepys goes to see king and gets royal orders back to Mayor so he starts to pull down houses BUT it is already too late. The fire is spreading fast and Londoners start to flee. Getting his priorities right, Pepys buried a big cheese and wine in his garden! Day 2: Monday 3rd September The fire spread throughout the 3rd, despite the efforts of the Duke of York who was given command of fire-fighting that morning and began to bring better organisation to the fight. The only success came at Leadenhall in the north-east, were a combination of low wind and the leadership and wealth of one citizen which enabled him to hire sufficient labour to create a working firebreak stopped the blaze advancing. Paranoia over suspected plots meant that people start attacking foreigners in the street. James is forced to spend a lot of time saving foreigners from attacks by the London mob. Day 3: Tuesday 4th September By sunrise September 4th, the fire was at its peak, an estimated ten times as strong as twenty-four hours previously. The success at Leadenhall was repeated on the 4th by other teams – one led by Samuel Pepys who now used gunpowder to clear great gaps in the city and build fire breaks In the east, the fire was stopped before reaching The Tower of London. However, in the north the flames remained unchecked, surging with avarice across Cheapside and the city market, and in the west they jumped across the River Fleet in spite of attempts to clear the bridge and nearby buildings. People ran and pushed goods and belongings INTO ST Pauls or up against the walls hoping it would protect them. It did not! By the midnight of the 4th/5th September, St. Paul’s Cathedral was surrounded and literally melting: the lead roofing flowed down the streets and building stones exploded from the heat. On the 5th two events conspired to save London: firefighters started to actively, use gunpowder to clear firebreaks on a wider scale. More crucially, the powerful east wind dropped. There was still a great struggle Pepys reports than even the King was seen helping but the tide had turned. Small fires still burnt by midday on Thursday 6th 1666, but they were soon under control. There was something of a witch hunt during and after the fire looking for the culprits and the London mob chased down any foreigners or just someone who looked a bit odd. A mentally ill Frenchman admitted to causing the fire and although it was shown that he could not have done so he was still hung. In the end calm prevailed and it was realised by those in government that it had just been an accident made worse by the condition of the city. It is estimated that the destruction included 13200 houses, 87 churches, 44 Guild Halls, St Pauls Cathedral, Baynards Castle, the Royal Exchange, Newgate prison and many other important sites. Maybe 1 person in 3 or 4 of greater London was made homeless. Something like £14 Billion of damages in today’s terms was caused. For some this was an opportunity. Unscrupulous bankers made a fortune giving loans at huge rate sof interest to assist rebuilding. Landlords discovered that they would insist on the properties they had rented out being rebuilt at the tenants cost and usually ended up with buildings of greater value. A massive legal process ensued with court cases going on for years. Others had higher aims. 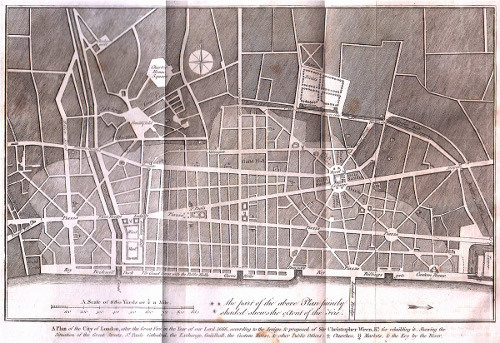 John Evelyn and Christopher Wren both submitted plans for rebuilding the city. The warren of streets would be swept away and broad avenues and squares echoing the glories of Italian cities brought in. In the end though landlords insisted on their houses being rebuilt and the best that Wren achieved was the contract to design and rebuild London’s churches including the magnificent St Paul’s Cathedral. The Praesidium order were the original instigators of mankind’s triumph over the demons. Throughout history they have acted to keep the demons away from our world and have opposed the Liberati’s attempts at each stage. Three Hundred years ago the Liberati warlock Steven Blake freed the demon Dantalion but ther Praesidium were there to stop them. Their leader Cornelius Silver Imprisoned Dantalion beneath London. Now, in the year 1666, the Liberati are back and aim to free the demon. A year ago the Praesidium were all but destroyed. Can the surviving member, Gabriel, Â manage to defeat their plans? What happens in the end?Â To find out readÂ The Last Seal. Summary: Cheerful, cheeky butÂ initiallyÂ selfish young thief who must decide whether to risk her life to save her city. More info: Orphaned during the plague, Freya scrapes a living thieving and pick-pocketing. One day she is caught red handed and shifts the blame on the schoolboy Ben and with him evaded capture. This chance meeting throws her into an encounter with rival secret societies.Â OneÂ of them wishes to free a powerful ancient demon imprisoned under the city by their rivals. Initially she refuses to take sides unless she gains a reward but her decision on which side to back and whether to take risks to protect her beloved London is pivotal in the ensuing struggle. Richard’s note: Freya is probably my favourite character Â The Last Seal.